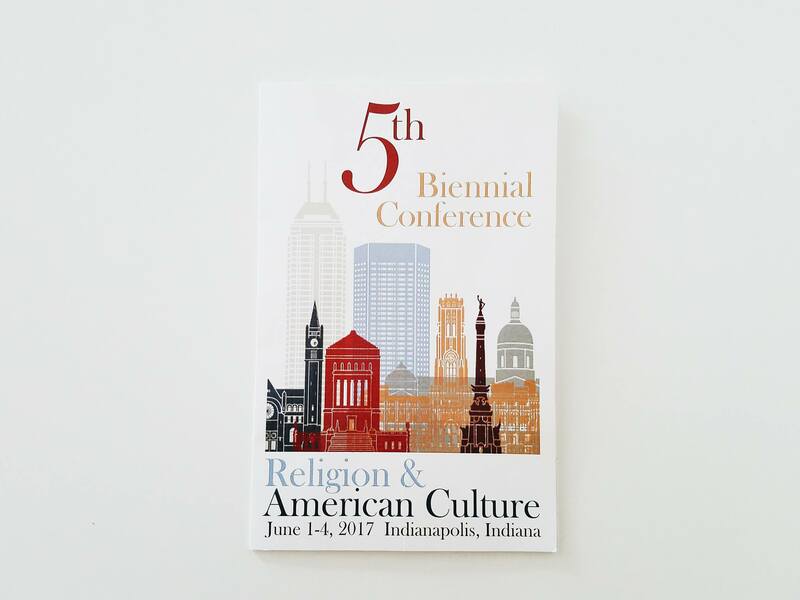 Just this last weekend I had the privilege of attending the 5th Biennial Conference for the Study of Religion and American Culture held in Indianapolis. I started coming to the event in back in 2011 as a master’s student and religious studies neophyte. Although I missed the inaugural meeting, I’ve been present at every gathering since then. From the unorthodox spatial arrangements, to the high caliber emerging or advanced scholar panelists, to the typically hip hotel environs, the biennial is a happening event. For younger scholars, coming to this conference can be an exceedingly intimidating and yet rewarding experience. Where else would one get to come into such close contact with the very people whose names fill one’s comprehensive exams lists? The Biennial is like the AAR minus the oceanic crowds and miles of hurried rushing between panel locations. One such recurring theme was the question of Christian hegemony. Mike Altman broached the subject as early as the second panel, tweeting that “religious freedom’s just another word for Protestant hegemony” in one instance, and questioning if “the category ‘religion’ is itself a hegemonic Christian” concept in another. The idea of Christian or Protestant influence came up in a number of different registers during the rest of the conference. Some panelists spoke of “Christian normativity.” Others questioned “Christian dominance.” One or two discussants clarified the notion as “Christian privilege.” Still others explained the matter as a situation structured by a pervasive and sometimes dangerously invisible “Christian implicitness.” Occasionally commenters wondered whether descriptions too uncritically built upon liberal hegemonic consensus or non-evangelical boundary maintenance in the academy. At least one person attempted to interrogate the normative stance that evangelical Christianity equals “bad” religion. Altman later urged the gathering to be more specific about how it was marshalling its descriptive, value-laden terms. “We’re conflating a whole lot of stuff with this ‘Christian hegemony’ term,” he noted. Melissa Wilcox offered a working definition of the hegemonic as that which “feels natural,” a position that tracks well with the Bourdieuian concepts of common sense, the taken-for-granted, or doxa. Gauging from facial expressions and subtle body languages, I wondered if at least some people in this room made up of primarily historians were frustrated with the invasion of Antonio Gramsci into the sacred space of American religious history. I don’t think this was consistently the case, but post-panel conversations confirmed that at least some attendees were less then enthralled. The concern about Christian dominance was arguably the conference’s most recurring subject. Khyati Joshi was the first panelist to address the issue of hegemony head on. Joshi suggested that scholars ought to study and scrutinize the hegemonic itself rather than simply essentialize about it through liberal academic assumptions. Only in studying the powers that be, she argued, can we address issues of structural inequity. On the last panel of the conference, Katie Lofton brought the conversation back by reminding the room that religious studies scholars and American religious historians are an immutable part of the hegemonic system. As institutionally appointed scholars, funded by foundations and monetary reserves each with their own ideological commitments and agendas, religious studies academics are in Gramscian parlance traditional intellectuals (as opposed to organic intellectuals). Scholars thus serve in state-sanctioned entities constituted by processes of segregation, difference, and systems of enforced prestige. By our own work, and not unlike the state, we organize humans and bodies into descriptive, normative categories. Religion scholars are hegemonic subjects; hegemony is our habitus. We conduct our actions within regimes of power that enable us to pursue our own ends but as embedded actors within systems of constraint. To summarize Lofton, academics exist within an exceptionally “fraught” system of affairs. We are, ourselves, “figures of contradiction.” As Sylvester Johnson argued from the crowd, academe proceeds by way of privilege, which in turn operates along exclusionary processes. Academia itself is an engrained social hierarchy at the top of which Ivy League and other capital-rich institutions fabricate and control standards of “prestige.” According to Lofton, due to the wonders of privilege such institutions have more access not only to reserves of cultural and intellectual capital, but more practically to economic resources with which to fund scholarly endeavors and research projects. Lofton’s talk was nothing short of a spoken word theory of academic complicity. As an Americanist who does critical theory, I find Joshi’s call to study hegemony particularly lucid. Is it correct that, as I’ve heard it suggested, scholars ought to refrain from studying conservative Protestants and take up the study of minority groups? Let’s be crystal clear about a few things: Studies of non-Christian religious formations in the Americas are certainly needed and necessary. And as one commenter pointed out, and segments of my own research confirms, not all Christianity is hegemonic. But I want to challenge (or at least nuance) the claim that in order to pluralize and diversify American religious history we need to showcase alternative, minority voices by putting dominant religious expressions on a back burner. My concern is that such a strategy of concealment—i.e., ignoring or pretending that the Protestant-centric model of American sociocultural formation is not present—would counterintuitively underwrite, extend, reinforce, or more rigidly normalize Christian hegemony. How does taking Christianity out of the limelight, effectively shielding it from critical analysis, help to speak to issues of power and dominance? What we need are not more poorly construed, quasi-autobiographical conjectures, liberal biases, or assumptions about the colonializing effects of American conservative Protestants. What we need, rather, are sustained, analytical, and quantitatively and qualitatively thick studies of dominant forces and their practices, artifacts, structures, ideologies, and rituals. So, to conclude, how can scholars resist hegemonic forces? What do we do with these heavily Christian-centric academic genealogies? How can university professors get beyond serving as mouthpieces for Christian hegemony? What is the role of the scholar of religion in an age of Trump? How can we survive with any last shred of intellectual integrity given neoliberalism’s persistent encroachment into the domains of the academy? The conference ended on an unsettling and ambiguous note. As Cara Burnidge tweeted, “#RAAC2017: you are in a position of power, how will you use it?” There are no easy answers to these questions. But to take a clue from social theory, I find it a somewhat consoling reminder the fact that we exist as both subjects and agents. We act within structures of power and prestige but might in small and steady ways exert changes in the overarching system over time. The biggest take-away for me personally was the confirmation from other scholars that to address structures of power you have to actually study them. We can’t simply pretend the structures don’t exist. And we may have to use the institutions’ own resources to study the institution. What are your thoughts? Do any of these conference proceedings resonate with you? What is the place of religious studies scholarship in American culture, politics, economics, and society? Leave feedback below. Travis Cooper is a double PhD candidate in anthropology and religious studies at Indiana University and lecturer at Butler University. His research interests include method and theory in the study of religion, discourse analysis, social media, critical ethnography, digital anthropology, and social theory. He’s currently dissertating on the boundary maintenance strategies of emerging evangelical communities after the New Media turn. Read more about his publications and research at traviswarrencooper.net. This entry was posted in Academy, Conference Notes, Guest Contributor, Politics and Religion, Religion and Society, Religion and Theory, Religion in the News, Ruminations, Theory and Method, Theory in the Real World, Travis Cooper, Uncategorized and tagged "Nones", American culture, american protestantism, Americanists, Biennial Conference for the Study of Religion and American Culture, Cara Burnidge, Christian hegemony, Christianity, Conference, Daniel Silliman, Digital Methods, diversity, evangelical Christianity, Evangelicals, hegemony, Kathryn Lofton, Khyati Joshi, Melissa Wilcox, Mike Altman, pluralism, Power, Protestantism, raac, raac2017, Religion, Religion and the State, religious studies, secularism, social theory, structuralism, Sylvester Johnson. Bookmark the permalink. Because no one is hiring in those fields? Because Western esotericism is take seriously only at the U. of Amsterdam (and maybe Michigan State) and NRMs perhaps at UC-Santa Barbara? I wish that it were otherwise.